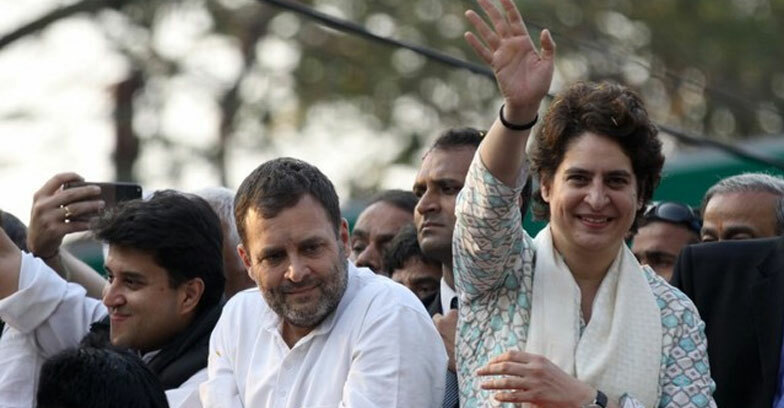 The most awaited entry of Congress general secretary Priyanka Gandhi Vadre,her debut rally in Lucknow won exciting welcome by Congress supporters and people.The Priyanka chants showed that people placed her on their hearts with the same respect they have towards Indira Gandhi. Crowds showered rose petals on the great-granddaughter of India’s founding leader Jawaharlal Nehru as she took an open bus tour through Lucknow, capital of the key northern state of Uttar Pradesh.The crowd seemed to be in a magical spell of Indira’s grand daughter,as they chanted her name repeatedly. Many even wore pink t-shirts emblazoned with her picture. Prior to the debut rally Priyanka also started a twitter account,which within an hour got 85,000 followers. By her debut, Congress is aiming at regain the UP’s 220 million people that the BJP nearly swept in in 2014 elections, winning 73 of the 80 seats. Analysts say Narendra Modi will face a tougher fight this time from Congress which won a clutch of state polls in late 2018, tapping into discontent over the lack of new jobs and farm debt.